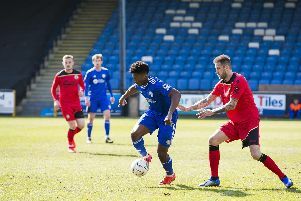 Injured striker Richard Peniket is determined to repay the faith shown in him by FC Halifax Town after agreeing a new one-year deal with the club. The Town front-man, who scored 12 goals in 41 games last season after joining from Tamworth, injured his anterior cruciate ligament during Town’s 0-0 draw at Altrincham in March. Peniket was operated at the Yorkshire Clinic in Bingley by renowned surgeon Dr Steve Bollen, who has previously worked with Paul Gascoigne and Michael Owen. It is hoped that Peniket, who has signed a new one-year deal at the Shay, could now be fit by the end of the year. The forward is keen to work his way back to full fitness as soon as possible and prove the club were right to retain his services. “I felt I did well in my last few games and obviously they’ve seen enough in me that I’m worth keeping on,” he said. “Hopefully I can repay that faith that the club have shown in me. “Neil (Aspin) gave me a ring before the operation to wish me luck - he’s been really good with me. Peniket said the operation went well but is still in the early stages of his recovery. “It was pretty routine, a fairly standard procedure and there no other problems with it,” he said. “I was in there for one night and was able to walk out the next day without any crutches, which was a nice surprise. “Usually with an operation like that you’d think you’d need crutches. Peniket is in contact with Town physio Jon Worthington and the surgeon to assess his progress, but admits he’d rather be joining in with pre-season rather than sitting on the sidelines when the Town squad report back from their summer breaks. “It’s massively frustrating,” admitted the former Fulham youngster. “All you want to do as a player is play and to not be able to do that for at least six months is quite hard to get your head around. “I’ve got used to it now but all I can do is look forward and work hard to get back as quickly as possible. “I’ve had other injuries that have kept me out for pre-seasons but never one where I’ve known I’ll be missing it. However, Peniket is keen to ensure he doesn’t rush his return and trigger any repeat of the injury. “I’m pretty clear about what I’ve got to do,” he added. “I’ve been doing some fairly simple exercises but you get to the more advanced stuff after about four months and the really hard work begins. “I’ve just got to take it slowly and make sure I’m 100 per cent ready to return.